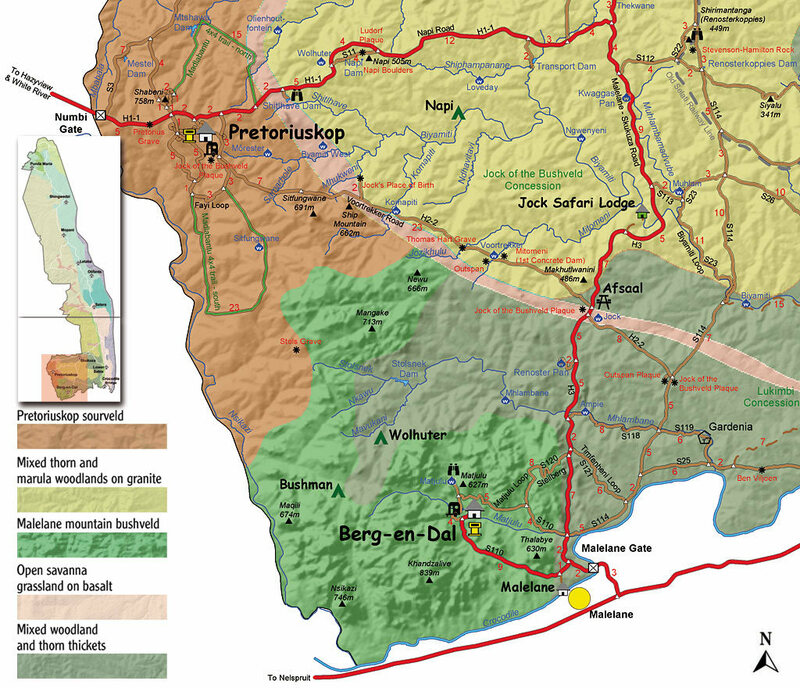 The road from Numbi to Malelane incorporates the terminalia/bloodwood woodlands of the higher altitudes around Pretoriuskop, the Knob-thorn/Marula savanna of the lowveld and then the Malelane mountain bushveld around the Crocodile River. The Voortrekker Road is one of Kruger's vintage routes, steeped in the folklore of Jock of the Bushveld and the 19th century transport riders who plied their trade between Portuguese East Africa and the Transvaal goldfields. The road roughly follows the old wagon route, descending from the terminalia woodlands of Pretoriuskop into the rolling, lowveld grasslands around Afsaal. Cisticolas and warblers are plentiful in the grasslands on the edge of the woodland bush. They regularly fall victim to the kestrels, hawks, falcons and other smaller raptors that occupy the Pretoriuskop sourveld. It's a good game and bird-spotting road because it is on the sweetveld intrusion into the sourveld between Phabeni and Afsaal. The road is also known as the Jock of the Bushveld Road after Sir Percy Fitzpatrick's famous terrier. A plaque off the H2-3 near Ship Mountain marks the place where historians believe Jock was born. This is a good area for Dark Chanting Goshawk. Its persistent call is often heard at dawn in Kruger, a sharp series of melodius fluted whistles wheee-o, whew whew whew , particularly during its winter breeding season. Ship Mountain is a distinct outcrop of gabbro that rises out of the lowveld like the upturned hull of a ship. It has always been associated with mystery and there are persistent rumours of saddlebags of gold buried at the foot of the mountain. The vocal and territorial Pearl-spotted Owlet may be seen near the lichen-covered rocks of Ship Mountain on overcast days or late in the afternoon. The Groundscaper Thrush, Senegal Lapwing* and Chinspot Batis are seen along this road which has an abundance of Southern Yellow-billed Hornbills, Cape Glossy Starlings and Lilac-breasted Rollers. One of Kruger's rarer birds, the Cuckoo Finch, has been recorded here. There are only an estimated 250 breeding adults in the Park. Not much is known about this little, olive-yellow bird - it follows the rain around the grasslands of southern Africa, feeding mostly on seeds and partly on insects. A good birding spot on the Voortrekker Road is the woodland around Josekhulu Drift. There is an old outspan post near the Mitomeni Water Hole where the transport riders used to rest and occasionally practice their shooting against the giant Leadwood trees. The Magpie Shrike* and Black-collared Barbets, Sombre Greenbuls* and a variety of kingfishers are all active here. Look out for raptors above the rocks near Afsaal. For details on the road from Afsaal to Malelane, see Malelane to Skukuza via Afsaal and Afsaal. A Lilac-brested Roller cost the life of a young German adventurer on the Voortrekker Road late in the 19th century. Adolf Soltke was hitching a ride on a transport wagon when he aparently saw a Lilac-brested Roller close by. In his haste to jump off the wagon and shoot the bird for his collection, he shot himself in his leg. He died of gangrene several days later and was buried close to the reupted birth place of Jock of the Bushveld. The site is accessible off Voortrekker Road (H2-2) between Ship Mountain and Afsaal.